Crown Pointe is an exceptionally planned, coastal community located in Hampstead, NC. The community greets you with a stately entrance and majestic oaks surrounding a natural pond and fountain. Lush landscaping, winding roads and custom street signs are just some of what makes the community unique. Crown Pointe offers large wooded home sites that preserve the natural beauty of the land and the finest quality homes built by the areas most respected builders. You’ll find a long list of amenities including access to Virginia Creek for canoeing and kayaking, clubhouse, pool and sidewalks for strolling and biking. The property borders Virginia Creek affording residents breathtaking views of the Intracoastal Waterway and Topsail Island. 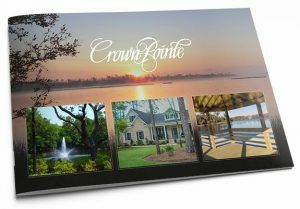 Fill out the form below and we'll send you the Crown Pointe lifestyle guide!